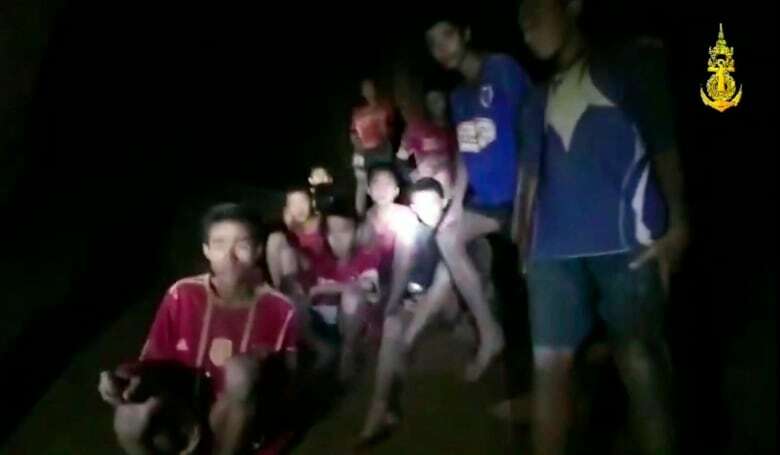 Now that the missing Thai soccer team has been found, the next step is figuring out how to get the boys and their coach safely out of a partly flooded cave in northern Thailand. Here's a look at the options and why extracting the 12 boys and the coach could take some time. Now that the missing Thai soccer team has been found, the next step is determining how to get the boys and their coach safely out of a partly flooded cave in northern Thailand. Here's a look at the options and why extracting the 12 boys and the coach could take some time. ThamLuangNang Non cave in Chiang Rai province stretches under a mountainside for up to 10 kilometres, much of it a string of narrow passageways that lead to wide chambers and then back to narrow passageways. The rocky and muddy ground makes several changes in elevation along the way. The British Cave Rescue Council, which has members taking part in the operation, estimates the boys are around two kilometres into the cave and somewhere between 800 metres to one kilometre below the surface. Other estimates put the boys as far as four kilometres into the cave. Finding the boys took more than nine days, partly because of how difficult it is to move around the cave. 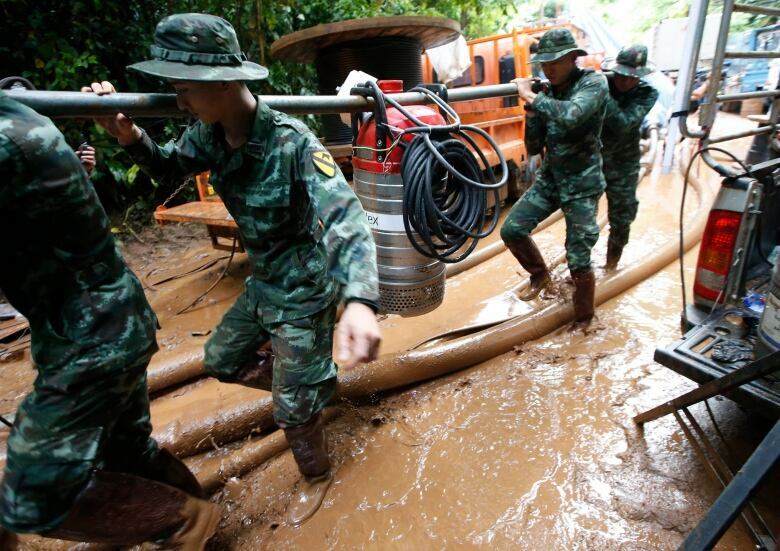 The cave floods during Thailand's rainy season and even elite Thai navy SEAL divers were finding it difficult to move through the muddy waters, currents and tight passageways. "The environment that they're in will have next to no visibility, fairly strong currents, very serious navigation hazards," Doug Munroe, an experienced cave rescuer with the Alberta/B.C. Cave Rescue Network, told CBC News. 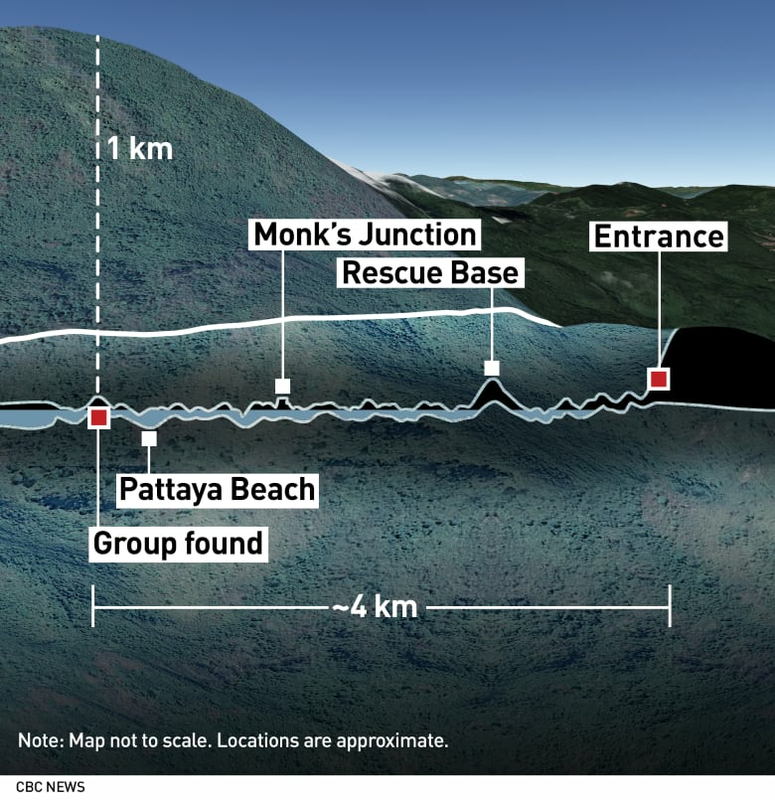 At the time the boys were found, water levels in the cave were rising more than 15 centimetres every hour. 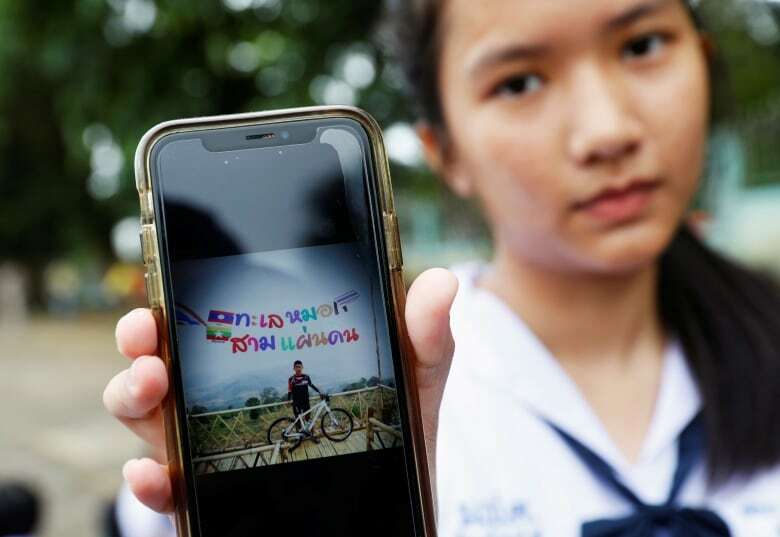 Thai authorities say they are committed to "100 per cent safety" when they consider how to extract the boys, who don't appear to be in urgent need of medical evacuation. Chiang Rai provincial Gov. Narongsak Osatanakorn said: "We worked so hard to find them and we will not lose them." According to Anmar Mirza, national co-ordinator of the National Cave Rescue Commission in the U.S. and editor of the book Manual of U.S. Cave Rescue Technique, the main decision is now whether to try to get the boys out of the cave or to provide them supplies in place. This is possibly the safest option. It would involve bringing food and other supplies to the boys and waiting for water levels to drop, naturally or by pumping out water, or until rescuers can find or create another exit. This could take anywhere from days to weeks to even months as the rainy season typically lasts through October. The Thai navy is already doing this short term, sending teams with high protein liquid food to feed the boys, keep them company and exploring the cave infrastructure where they are to ensure it is safe. The navy said medics will be sent to help and improve conditions in the cave. 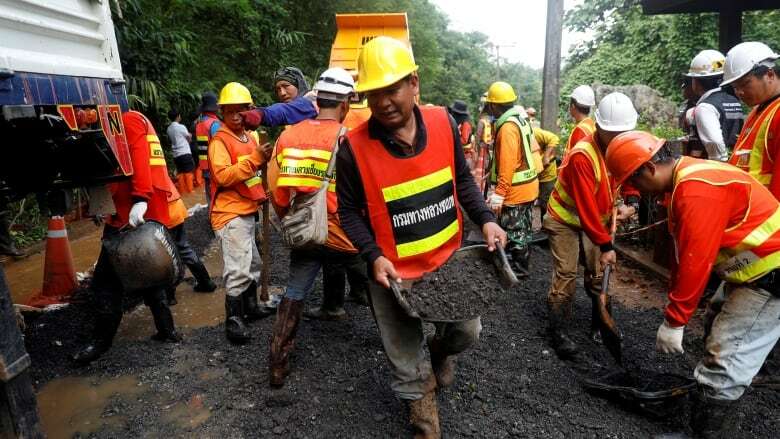 Rescuers are also trying to pump water out of the cave, but the government says some areas cannot be drained. More monsoon rains are on the way. After a break in the weather in recent days, the Thai Meteorological Department forecast for Chiang Rai calls for light rain through Friday followed by heavy rain starting Saturday and continuing through July 10. Such storms could raise water levels in the cave again and complicate the supply missions or any potential extrication, if one was needed. Interior Minister Anupong Paojinda said as a result of the forecast, the boys may need to swim out using diving gear. He said they would be brought out via the same complicated route through which their rescuers entered. Along with the search efforts inside the cave, rescuers have searched on the mountainside for possible ways into the caverns below. Authorities said those efforts will continue. Backhoes and drilling equipment were sent to the mountain, but creating a shaft large enough to extract the boys would be extremely complicated and could take a long time. 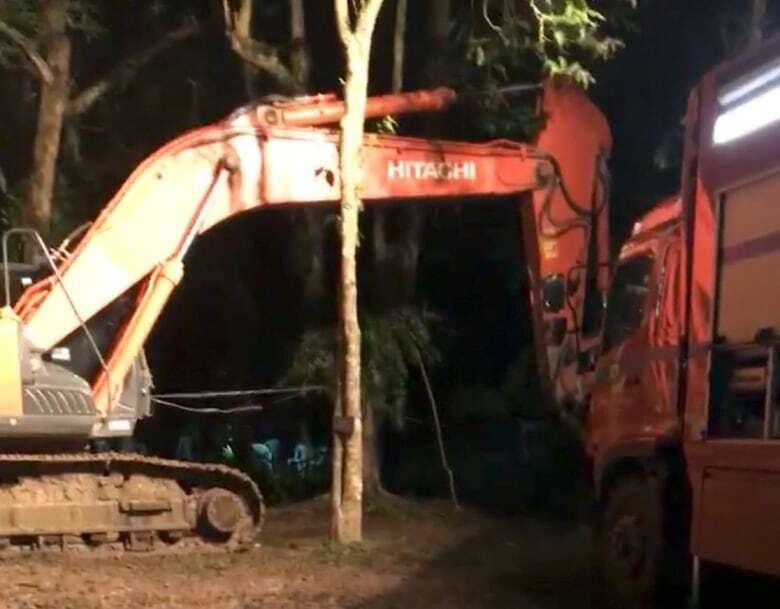 The British Cave Rescue Council said the boys are "located in a relatively small space and this would make any potential drilling attempt as a means of rescue very difficult." Diving would be the fastest, but arguably most dangerous, extraction method. Mirza said that "trying to take non-divers through a cave is one of the most dangerous situations possible, even if the dives are relatively easy." In this case, the boys can't swim, said Ben Reymenants, a member of the rescue team, in a Skype interview with CBC News. And by all accounts, the dives into the cave have been a challenge even for experts in caving and diving, who needed days to reach the boys. Getting the boys out could go faster due to the installation of dive lines, extra oxygen tanks left along the way and glow sticks lighting the path. Still, the British Cave Rescue Council said, "Any attempt to dive the boys and their coach out will not be taken lightly because there are significant technical challenges and risks to consider."